Let me put this in context for you. When I wrote the original post about how to spot a good product manager, my experience up until that point had mostly been in the kind of companies that regarded product management as an evolution of project management – very process-driven. Gantt charts at dawn! As a result my initial take on measuring how well a product manager is doing was against that backdrop. Since then, I’ve learned a helluva lot from the dozens of different organisations I’ve worked with in the private and public sectors, many of which are embracing a more up-to-date approach to product delivery (i.e. user-centric, evidence-led, multi-disciplinary teams). In the UK’s Ministry of Justice, I was Head of Product for their digital team, during which time I was responsible for 12 product managers of varying degrees of experience. Each product manager worked with her or his own multi-disciplinary delivery team (product management, research, design, development and delivery management). It didn’t appear to occur to them – though I pointed it out repeatedly – that this was frankly a terrible idea. For starters, I knew that each person on my team was already a strong performer. Some of them had been in product management far longer that I had. Others were relatively new product managers, but even considering that were doing just fine, thanks. Even if it was possible to assess all 12 product managers on a relative, linear scale normalised for their relative levels of experience, my team was perfectly capable of reading between the lines – they’d object so much to the stack rank exercise that they’d probably leave on principle. And I wouldn’t blame them for doing so, because who doesn’t love being devalued and treated as a commodity, right? Each member of my team had different strengths and weaknesses, different backgrounds and levels of experience, different skill sets and different approaches. 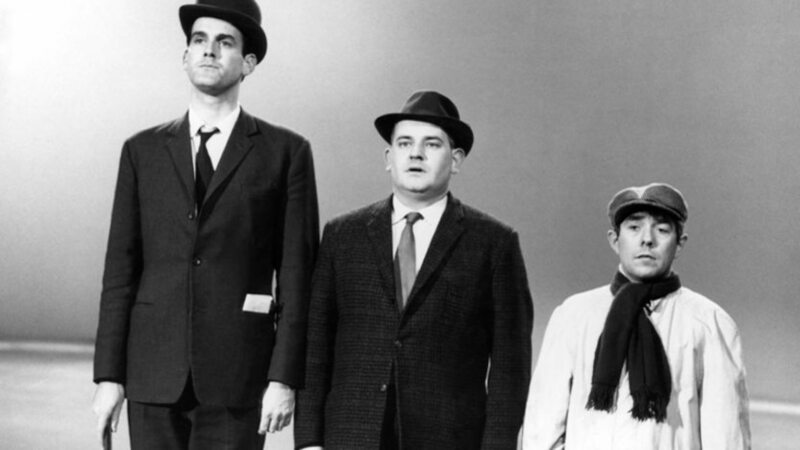 Sure, they were all product managers, but they each did product management differently. This was exactly what I needed them to do, because they were all solving different user problems. It was becoming clear that I couldn’t refuse to assess their performance outright. This would lead to my swift removal, then someone less protective of my team than me would simply pick an arbitrary metric, rank my team and fire a few of them. I could serve my team better by treading a fine line between compliance and overt disobedience. I would do some kind of performance assessment, but I’d structure it so that a stack rank was bloody hard to do. First of all, I sat down with my team and talked through what was going on. I then surveyed them to establish what they felt were the most important soft (emotional) and hard (technical) skills a product manager needed. We used the top ten or so as the dimensions for their assessment. I also asked them how conversant they were with skills from other disciplines they frequently would interact with, such as research, design, content and development. Then I got them to assess themselves individually. They gave themselves a score out of 5 based on how skilled they felt they were in each area. I then plotted the results for each individual on a polar chart, and compared that to the team average. Immediately it was clear to see where the team felt it was stronger and weaker. After seeing the results, several of my team took the initiative to start filling in the gaps: one person buddied up with another product manager who was more experienced in Kanban, another put themselves forward to do more public speaking, and so on. But the really interesting part was yet to come. I asked each of the delivery teams to rate (anonymously) their product manager on the same sets of skills. A product manager needs to be effective in their interactions with their multi-disciplinary team, so I was interested in their team’s subjective perceptions of their product manager. Were they good communicators? Did they inspire? This exercise again yielded some interesting insights. 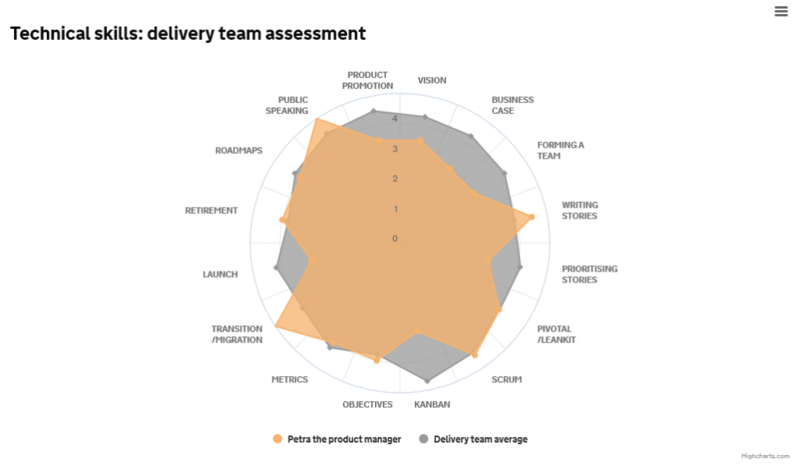 In some areas the product manager’s self-assessment and their delivery team’s assessment were in agreement. In others, the product manager had rated themselves weaker in an area, while the team thought they were particularly strong – and vice versa. These findings were also worth exploring further. Lastly, I asked senior management to rate the product managers in the same way I’d asked the delivery teams to. With a couple of notable exceptions, it was clear that senior managers had next to no idea how to answer the questions – they simply weren’t close enough to the product managers to make any kind of assessment. While this highlighted a failing of the senior management team in what was declaring itself to be a ‘flat organisation’ (yeah, right), it also was a point for improvement in the product managers. Given how reliant they were on having senior management’s support to keep things moving apace, clearly they needed to invest more time into stakeholder management. So, what do I want you take away from this? I used Highcharts to render the charts. Each product manager had their own page – for their eyes only. Senior management only got to see the aggregated averages in case they got any big ideas. I’ve got a live demo of the full report page available if you fancy taking a look. Needless to say, for this article the individual’s data has been anonymised (there was no product manager called Petra) and slightly randomised. 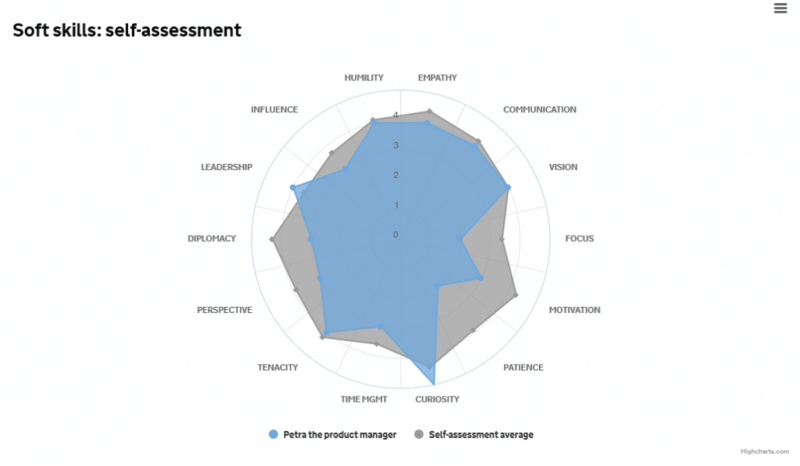 Similar versions of the self-assessment survey were also used for the product manager’s team and for senior management. If you have any questions, pop them in the comments below. This entry was posted in 100 Things I've Learned and tagged KPI, measure, metric, objective, performance, product management by Jock Busuttil. Bookmark the permalink. 1. Products don’t provide value to prospective buyers and users. 2. Developers don’t know what to build, and why. 3. Sales and marcom can’t consistently articulate the value of products. 4. The process of learning the market is slow and unreliable. As you can see, the problems primarily relate to stakeholders on the team who are not empowered to build, market, and sell a product that delivers true value to customers. The question, then, is the extent to which a product manager is empowering the team to make sound product decisions. 1. Do all the stakeholders understand the product’s unique value proposition? 2. Do the stakeholders have confidence that product decisions reflect an understanding of the ever-changing market? 3. Do the stakeholders believe the pace of learning is sufficiently fast? 4. Do developers know why they are building what they are building? 5. Does the product actually deliver its unique value proposition? 6. To what extent is the product manager helping each member of the apply her unique talents? To be sure, product managers need certain talents and skills to perform well. But the performance of a product manager – the extent to which those talents and skills are addressing the challenges that product teams face – lies in the answers to these sorts of questions. Thank you for taking the time to comment. The points you raise certainly reflect what happens in real life, but I think they also highlight the problems I’ve seen with the way product manager performance is typically done. 2. the performance of factors outside their direct control, such as the performance of other teams. A product may be performing well or badly for a number of different reasons, but it is perfectly possible for a well-performing product to be managed badly by a product manager, and vice versa. So product performance by itself isn’t a reliable indicator for how well the product manager is doing. Similarly, teams such as Marketing and Sales should be expected to do their own jobs well, but again whether they do or not is often independent of whether the product manager is doing her job well. I expand on this in the original performance article I wrote. Lastly, you put a lot of emphasis on alignment across internal stakeholders and the delivery team. I do agree that these are important parts of a product manager’s role – it would be very difficult to create a successful product without good buy-in and alignment. Again by itself it is not the only aspect of a product manager’s performance to take into account. Jock, note that, contrary to your assertion, I actually did not propose any evaluation criteria that assess product performance. Rather, I enumerated the problems a product manager solves, correlating to functions that a product manager performs to address these problems that stand in the way of product success. I then enumerated questions that shed light on the extent to which the product manager is successfully performing these functions. I did not mention product sales, revenue, or any other product performance metric. As you contend, many factors outside a product manager’s direct purview contribute to the performance of a product. If developers don’t competently carry out their duties, product performance will suffer. If sales doesn’t competently perform its functions, product performance will suffer. If marketing doesn’t competently perform its functions, product performance will suffer. I blogged about this issue in 2005, writing then that I did not believe product performance equals product management performance. But to the extent a product manager hasn’t facilitated process that empowers, with strategy and context, developers, sales, and marketing to succeed, she is responsible. You can make the case that the answers to the evaluative questions I enumerated still depend on the competence and abilities of others. I welcome tweaking the questions to get more directly at the product manager contribution.